Philippines is an archipelago in Southeast Asia that consists of 7107 islands with the total area of 115,813 Sq Mi. It is located between 16° 40' and 126° 34' E. longitude and 4° 40' and 21° 10' N.
Here in Manila and most of the Philippines, we experience two distinct seasons that can be categorized as wet and dry. Humidity levels are usually very high all year round. 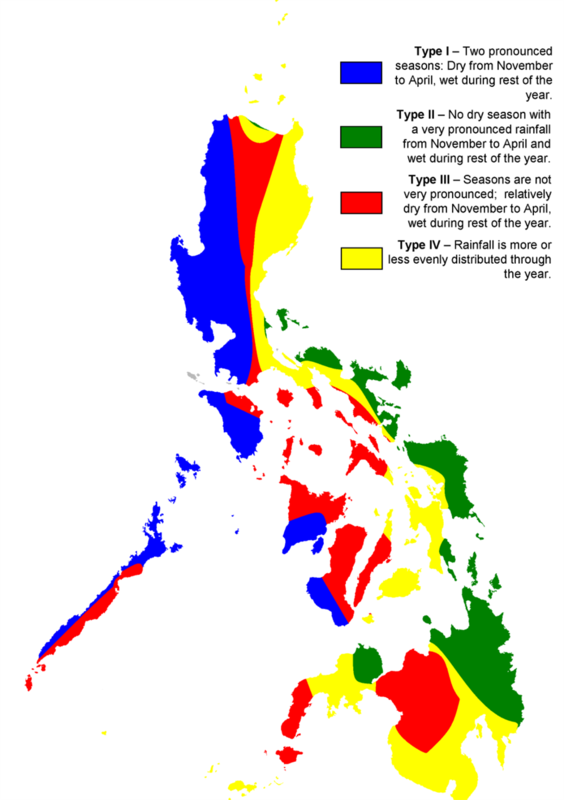 The summer monsoon season brings heavy rain to most of the Philippines from May to October. The dry season, from November to May can be cooler from December to February and hot from March to May. Climate Map of the Philippines Based on the Modified Coronas Classification.